As Charlotte, North Carolina faces its second night of protests in response to the police shooting death of Keith Lamont Scott, one unusual scene has emerged: a conversation between a policeman and a Charlotte protester. Amidst multiple reports of violence Wednesday evening, including the shooting of at least one civilian, this dialogue between an officer and protester offers a different narrative for the night. The pair are seen conversing about the rules of engagement, and the responsibility of police to respond to threats fairly. The dialogue was captured by AJ+. Protesters can be seen standing in front of several officers in riot gear, with one demonstrator engaging in heated conversation with an officer. He asks the officer: "As a captain, why haven't you incorporated the rules of engagement?" The protester goes on to explain his time in the military, saying, "When I was overseas, we had to use the rules of engagement before we could shoot somebody. Why can y'all shoot an unarmed man? How? And then y'all say he was armed like that justifies [it]. We got a right to bear arms. He can have a gun. He can have a gun." He finished by asking, "Why y'all shoot him?" The officer then asked, "So your rules of engagement are deadly force and not, right, for the military?" Quickly responding, the protester said, "Propose a threat when threat proposed." "So what we have is not only deadly force," the officer explained, "but all of these different levels of force that we have to try to deal with." 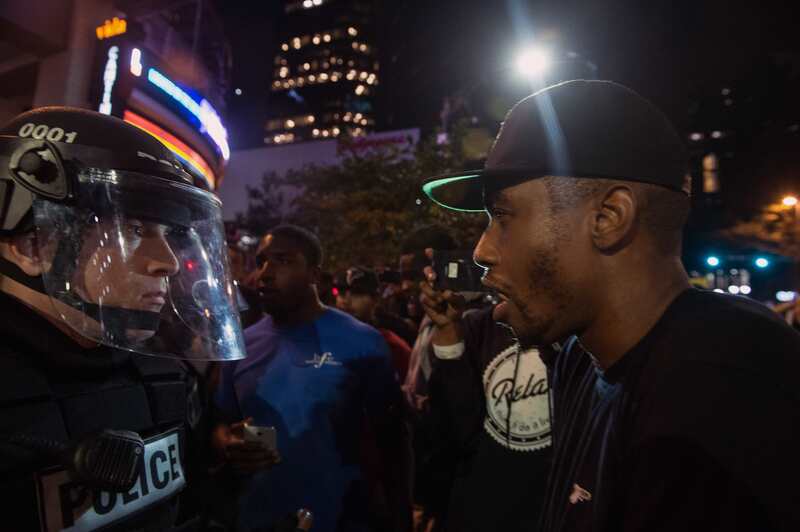 The logistics behind the rules of engagement aside, what's remarkable about this conversation — in addition to the fact that it was captured by a member of the media at all — is that it is one of the first accounts we've seen from the Charlotte protests in which a policeman and protester are actually interacting. During these moments, when tensions are understandably high, two people are still able to have a constructive conversation. An officer and a protester can explain their positions in a safe manner. That isn't to say, of course, that protests aren't constructive, peaceful, or otherwise. But this officer's willingness to engage in conversation with a protester (indeed, engaging with community members is one of the tenets of the job) shows an additional, needed layer for change. This type of discourse between officers and community members is powerful, and should be commonplace. That fact that it can happen among these protests is evidence that it can happen anywhere, so long as authority figures approach the conversations in respectful, meaningful ways.